Uncertainty might be the true insight that emerges when we see this play done in original practice: did Armin, Richard Burbage, and the rest of the Lord Chamberlain's Men get to the play's very first opening performance and say, "Hey, Will, WTF?" Celia (Sarah Fallon) assures Rosalind (Tracie Thomason) of her unconditional affection after Celia's father, Duke Frederick, has banished Rosalind in the American Shakespeare Center's production of As You Like It at the Blackfriars Playhouse. Photo by Pat Jarrett, American Shakespeare Center. One of the wonderful effects of seeing a William Shakespeare play in a theater that replicates his company's indoor theater and is using the same production process that his own company used is to experience that play in all its glorious purity. In the case of As You Like It, you discover the play is pure bunk. I'm writing this as someone who has long enjoyed this play. Aside from having the second-most-famous speech in the entire canon (Jacques' "All the world's a stage…") and Shakespeare's first use of the Robert Armin–style Fool in Touchstone, As You Like It has a remarkable heroine in Rosalind, much witty word play, and several comical set pieces that still play fresh today. What it doesn't have is common sense. This particular production is a typically fine American Shakespeare Center effort, kicking off its 10th annual Actor's Renaissance Season at the Blackfriars Playhouse, a reconstruction of Shakespeare's indoor theater. The dozen actors, each assigned only their parts, put together the production with 20 hours of rehearsal sans director, sans costume designer, sans property manager, sans set—and, this time, sans sureness. Even though many of the actors have played in previous As You Like Its, one gets the impression the company is not quite sure how to tackle this play. That could change as the production's run continues (the Opening Night performance we saw was three shows in after less than a week of rehearsal). However, that uncertainty might be the true insight that emerges when we see this play done in original practice: did Armin, Richard Burbage, and the rest of the Lord Chamberlain's Men get to the play's very first opening performance and say, "Hey, Will, WTF?" For these next two paragraphs, I borrow freely from a friend, Charles, who has seen quite a few Shakespeare productions but doesn't hold the playwright in any idolatrous esteem. Charles's take is that As You Like It is the product of a playwright and theater impresario churning out scripts fast and furiously to meet demand. That certainly seems the case in 1599 when the play was probably first performed. As a playwright, Shakespeare was an established superstar in the London theater scene, and his company was about to open the Globe (As You Like It might have been the first play performed there). His output from around 1596 to 1601 was intensely prolific, including a sure example of his speed-writing ways with The Merry Wives of Windsor. I could see how Shakespeare, on deadline for the Globe opening, drew on the popular genre of pastoral comedies and slap-dashed together a play with a most telling title: As You Like It. And about that conversation, said usurping Duke putting together a massive army to root out the rebels, and with all this power and intent being stopped by a single "old religious man" at the edge of the forest. "What could this religious man have said to stop him?" my friend Charles asks rhetorically. Something so profound that the Duke decides he'd rather be a hermit in a cave than head of state. The actors' choices of costumes—which they scrounge out of the theater's wardrobe warehouse or their own closets—illustrate the play's patchwork personality. For Silvius, Andrew Goldwasser dresses in lederhosen-type knee britches, blue diamond pattern stockings, blue bows on his shoes, blue knit cap, and a motley llama-like vest. Allison Glenzer as Phoebe wears a blue chiffon poodle skirt, black tights, white bobby socks, red shoes (also with blue bows—that's one thing she and Silvius have in common), black vest with blue bow ties, blue head band, and red scarf. Jonathan Holtzman's Jaques is in a three-piece black suit, like a purgatory-obsessed preacher. Rosalind and Celia (Tracie Thomason and Sarah Fallon, respectively) wear flapper-era frilly dresses while in court; in the country Rosalind's Ganymede disguise is a pair of cargo pants with suspenders, white t-shirt, and tennis shoes, and Celia's Aliena is in red gingham, green waistcoat, and multicolored galoshes. Hodgepodge of humanity though it may be, this collection of characters is among Shakespeare's richest. Though the first half of this production slogs from the court to the forest, its energy picks up in the second half as the cast expertly and sans extraneous stage business scores laughs derived from the text. Even Hymen offers a comic payoff as Tim Sailer plays up the very ridiculousness of the character's presence in the play, his ceremonious lines read with the biting cynicism of an actor forced to play Hymen. Thomason eschews any deep meaning in her Rosalind and plays her as a wry humorist. John Harrell brings sophistication and style to Touchstone in gray pinstriped suit and a haughty bearing (no motley outfit or attitude for this fool, which makes Jaques's going on about the fool's motley coat nonsensical). 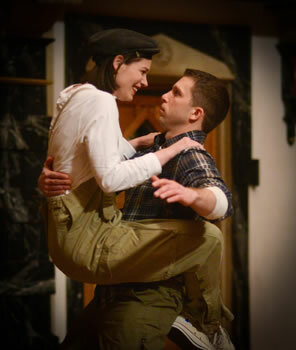 Rather than playing the fool as a traditional court jester, Harrell plays Touchstone as a court satirist, and that brings out the leering lustful relationship he pursues with Audrey, played by a carrot-eating Abbi Hawk in coverall shorts, red crop-top shirt, and cowgirl boots. While the rest of the cast mine their lines for their characters' comedy, Fallon mines Celia's silence. 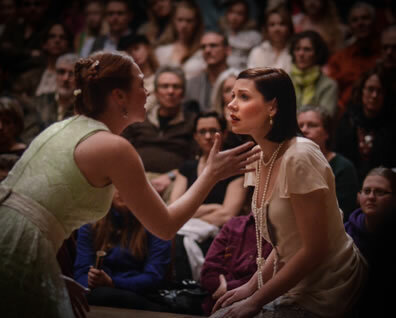 At the court, Celia is the instigator of conversation, games, and refugee status, and Fallon gives her a girlish earnestness as she dotes on all things Rosalind. In the forest, though, the disguised-as-a-boy Rosalind takes the lead in conversation, games, and refugee status, and Celia is relegated to silent observer. Fallon's Celia, though, is a keenly involved observer, and while she has few lines she remains a prominent player in every one of her scenes. In turns, this Celia looks admiringly, confused, pleased, perturbed, worried, and shocked as she watches her cousin operate. She physically intervenes on occasion, but most often she's off to the side using her expressions to comment on every one of Rosalind's ploys. All the while, she continues doting on her cousin, even after Oliver arrives and she falls head-over-heels into smittenness. Rosalind disguised as Ganymede (Tracie Thomason) launches herself at a bewildered Orlando (Gregory Jon Phelps) in the American Shakespeare Center production of As You Like It at the Blackfriars Playhouse. In this Actors' Renaissance Season production, the actors direct and costume themselves as they mount the play with less than a week of rehearsal. Photo by Pat Jarrett, American Shakespeare Center. In another of the production's most detailed portrayals, Chris Johnston gives Oliver an air of superficial privilege which, when coupled with the rough handling he receives at the hands of Duke Frederick, makes his own conversion—and Celia's instant infatuation with him—seem the only believable development of the play, python and lion notwithstanding. More realistic, though, is Duke Frederick's banishment of Rosalind, which René Thornton Jr. plays with an edge of real danger. Celia is most brave to defy a father like that. In the middle of it all is Gregory Jon Phelps as Orlando. For all of the great characters he gives us in this play, Shakespeare generally comes up short with his bland, easily forgettable male romantic lead. However, Phelps draws on Oliver's first-act description of his brother as "gentle, never schooled and yet learned, full of noble device." Being brave, naive, and impoverished yet gentle, intelligent, and noble is a difficult balancing act, but Phelps pulls it off, and he does so with a constant look of bewilderment that makes his portrayal endearingly funny. By the time Oliver arrives, Phelps's Orlando is giving way to the strangeness around him; he's even ready to accept the pretend Rosalind as a surragate for the real Rosalind (still unaware it is the real Rosalind) in their previous scene. So, he tells the Duke, who asks if the boy can do "all this that he hath promised," which is to produce the real Rosalind and make Phoebe love Silvius: "I sometimes do believe and sometimes do not." A few lines later he assures the Duke that, though the boy resembles Rosalind, Ganymede is forest born and bred and tutored by an uncle, "Whom he reports to be a great magician"; that last phrase Phelps delivers with a "yeah, right" expression. That's the natural expression you'd expect from a guy who, in two hours' traffic on stage, is deprived of his inheritance for no reason, loved by a princess despite his status, forced to flee his brother's unwarrented murderous jealousy, encounters a band of huntsmen in the woods who turn out to be banished courtiers, and meets a boy who looks kind of like the princess he loves and who endeavors to pretend to be the princess he loves so as to "cure" him of that love and then turns out to be the princess he loves when the god of marriage brings her on stage right before his own middle brother shows up but after his older brother has already shown up and is attacked by a python and a lion and, oh, my! there are pythons and lions in this French forest—It's not just the character who has walked into this plot, it's the actor, too. But this is Shakespeare's play, and we're sticking with it, take it as you like it.